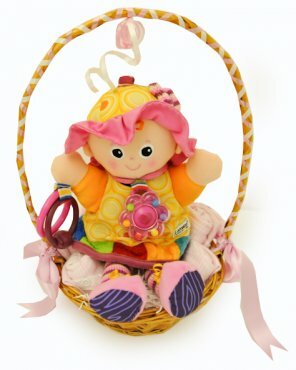 A unique and delightful combination of a bright colourful toy and traditional clothing wrapped as rosebuds making this basket a perfect gift for a new baby and parents alike. The basket contains a Lamaze toy My Friend Emily that features rattles, clacking rings, textures and sounds. Renowned for their quality and stimulation of baby’s imagination and senses these toys will soon become a firm favourite with your baby. They also have a linkable loop so can be attached to strollers and play mats and can be taken along with baby wherever they go. The gift basket also contains beautiful baby clothing including a crossover bodysuit and matching sleep suit both with embroidery of a scene of little flowers. Also included are 2 popover double sided cotton bibs that are hand folded as rose buds within the basket.